The residents of Quesnel are proud of their city’s beauty and accomplishments over the years. As more opportunities open up for Quesnel, it is time for the residents to secure the kind of peace of mind that allows them to enjoy their bright future. Optimum Security offers comprehensive security services for residential properties, commercial properties, and special events. We are the company to call when you want the best possible security services available. We hire only competent, experienced, and educated security officers and then put them through a comprehensive training program. All of our officers are trained on how to diffuse a wide variety of situations, and they have the equipment necessary to secure your property. Our officers wear prominent uniforms that make them the ideal crime deterrents, and they follow a regular schedule of patrols to keep your property safe. Our mobile patrol services are ideal for your commercial business complex, large residential facility, or your special Quesnel event. Our officers keep a keen eye out for any suspicious activity, including vandalism and suspicious behavior. 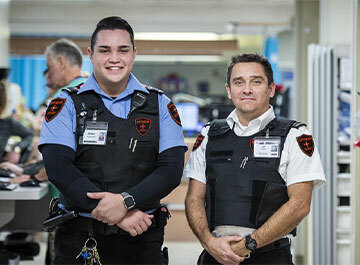 If a security event does occur, our officers are trained to work closely with the Quesnel police to make sure that each situation is handled properly. Your satisfaction and safety are our two primary concerns, and we have the experience and equipment necessary to make sure that you have full peace of mind. Optimum Security has full security systems and alarms to augment our security guard and mobile patrol services, or to help you protect your property. You can use our surveillance cameras to monitor activity inside and outside of your property, and you can use our intrusion detection systems to know when an intruder is around. Our smoke, heat, fire, carbon monoxide, and flood alarms give you ample time to avoid disaster. Call us today and let one of our courteous and professional associates give you the details on how Optimum Security can offer you peace of mind.